For two and a half years, Holly Pope has been at the helm of the Gateway Teen Science Café at the St. Louis Science Center. One of Holly’s favorite parts of the program? “… besides the teens learning and becoming excited about science, how much the scientists and STEM professionals enjoy working with the teens in the café.” This month we shine the Spotlight on Holly Pope. 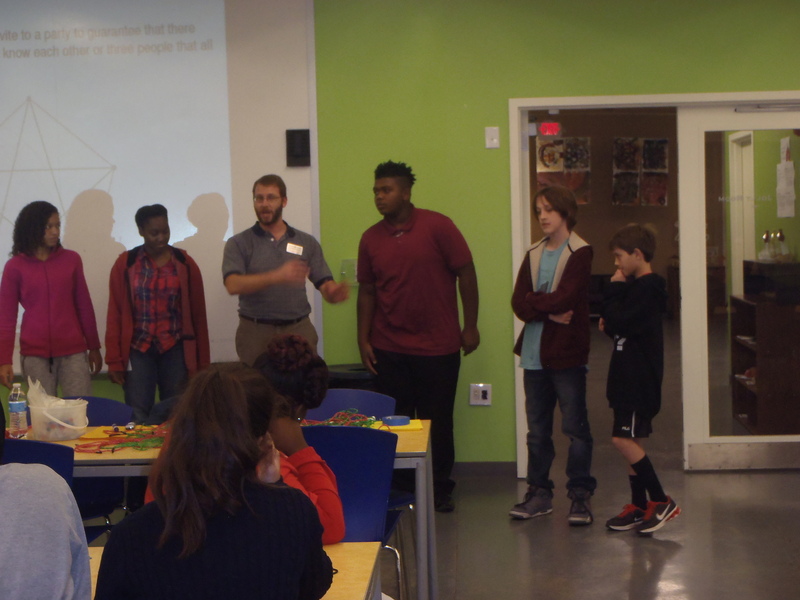 The Saint Louis Science Center’s Teen Science Cafe program is a part of the Gateway Teen Science Café node in the St. Louis area, which also consists of the Academy of Science-St. Louis and Cahokia High School just across the river in Illinois. Our teen leaders come from a variety of audiences, including homeschoolers, teens from our Youth Exploring Science (YES) Program, and teens from area high schools. One way in which we are unusual is that our site is a part of a node that works closely with one another. In this partnership, the three sites share scientists, meaning that a single speaker will gave the same café at each of the three sites. This provides scientists the opportunity to further develop their communication skills with teens by reviewing feedback, modifying their presentation, or improving the hands-on activity before the next café. The partner sites also share responsibilities for maintaining the website, writing grants, handling evaluations, etc. In addition, the Gateway Teen Science Café node was one of the original Teen Science Café sites! I received my B.S. in Biochemistry and Biotechnology from the University of Missouri-St. Louis. As an undergraduate, I enjoyed engaging the community and other students in science activities, which led me to take on leadership opportunities in extracurricular activities, such as Chemistry Club, Biology Club, and Student Government. I was fortunate to have had two years of undergraduate research experience studying DNA compounds that could be used to interfere with replication of the HPV virus that is associated with cervical cancer. After graduating from UMSL, I attended graduate school at Saint Louis University where I earned my PhD in Pharmacological and Physiological Science. My research focused on characterizing a new zebrafish model for studying axon degeneration, a feature found in several human peripheral neuropathies. While in graduate school, I had the opportunity to teach an undergraduate science course for non-science majors and found that my passion was in educating people about science. This then lead me to begin volunteering at the Saint Louis Science Center while still in grad school. After receiving my PhD, I began working full time at the Science Center, where I work with programs that include the Youth Exploring Science Program and Teen Science Café. I’ve been an adult leader for our Teen Science Cafes for two and half years. In addition to working at the Science Center, I am also an Adjunct Professor at the Honors College at UMSL, where I teach science classes for non-science majors. 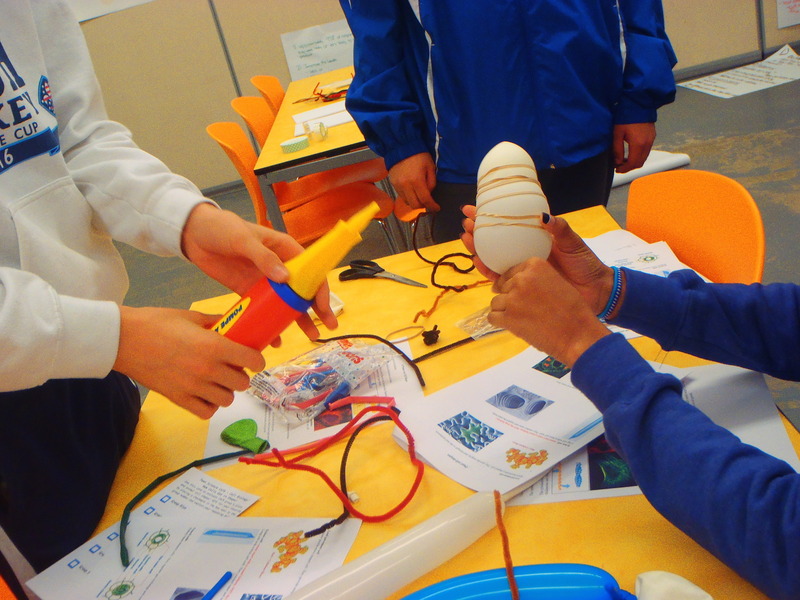 Hands on activities are an essential part of the Gateway Teen Science Café programming. Our program is based at the Saint Louis Science Center, whose mission is “To ignite and sustain lifelong science and technology learning.” By participating in Teen Science Cafes, teens are introduced to science fields or careers they may not be familiar with, and hopefully a passion for science is ignited by directly engaging with scientists in a fun and informal way. We not only want to introduce teens to science, but we want them to become lifelong science learners. By hosting six cafes each year, teens are invited to continue to learn about diverse STEM fields from speakers that are passionate about their research. In addition to funding, another stumbling block we’ve encountered is consistent involvement from teen leaders. The teens that have joined the Youth Leadership Team are involved in sports, extracurricular activities, and other academic opportunities. We’re very proud that our teen leaders are well-rounded and passionate individuals that take advantage of every opportunity presented to them; however, this makes it difficult to have teen leaders that are dedicated to the Teen Science Café program and have consistent attendance at cafes. My favorite café so far was one about cell biology and how cells get their shape. I enjoyed this café because it focused on a topic within cell biology that many people don’t spend much time thinking about—how the shape of cells has a dramatic influence on their function! What made this café stand out was seeing the teens use their creative and artistic side when making models of these different cell types using simple craft supplies and recycled materials. Teens using microscopes at a recent Teen Science Café in St. Louis. The part of the program that I like best, besides the teens learning and becoming excited about science, is how much the scientists and STEM professionals enjoy working with the teens in the café. Many of our speakers don’t have much experience engaging with teens and seem a little unsure about how well their presentation and activities will turn out. At the end of a café, seeing how much they enjoyed their experience is just as rewarding as seeing the teens enjoy the café. Hopefully, this will inspire these scientists to continue to engage with youth. Oftentimes, we’ve found that scientists and STEM professionals need a lot of help coming up with the hands-on portion of the cafes. When reaching out to scientists, think about what types of hands-on activities would be a good fit for their topic. Some topics require a bit more creative thinking than others. Relaying a complex concept in a creative and fun way can be quite challenging at times. Be sure to let your prospective speakers know that you will help them develop this portion of the café. Hopefully, this will help to keep them from feeling overwhelmed and lead to a more positive café experience for them. A very big thank you to Holly Pope for her time. We can’t wait to see where the café goes next.